Facing demands to replace decades-old ferries, remove barriers to fish migration at a multibillion-dollar cost and build highway projects promised in past years, state lawmakers unveiled plans last week for Washington’s next transportation budget. Democratic leaders in the House and Senate released two separate biennial proposals, each around $10 billion. Both plans would pay for culvert removal and highways, and both chambers are considering ways to fund new ferry construction by raising the cost to ride a ferry. The House proposal contains one funding source the Senate’s doesn’t: moving up new vehicle weight fees that were previously set to start in 2022 and putting that money toward culvert removal. Here’s how each plan would address lawmakers’ top priorities. Maintenance issues have sidelined ferries this spring, leaving some routes with fewer sailings than usual or smaller boats that carry fewer vehicles. Representatives for the state ferry system say the root cause is an aging fleet and a lack of backup boats. New ferries cost about $160 million each and take around two years to build, Sterling said. 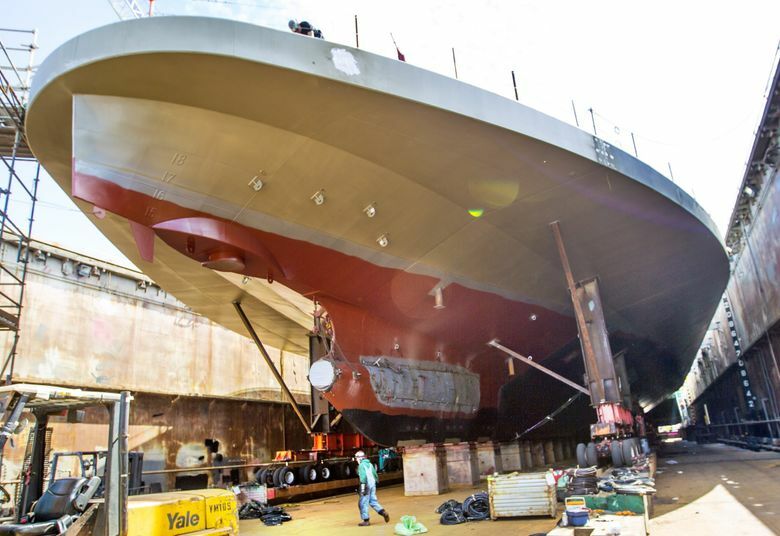 The House proposal includes $99 million to start building a new vessel and notes the intent to begin funding another in the next two-year budget cycle. The House would raise more revenue by increasing ferry fares by 6 percent and surcharges on vehicle passengers by 75 cents. The Senate budget does not include funding for a new vessel in the next two years, but senators are considering a separate bill, SB 5992, that would increase surcharges on ferry tickets to fund new boats. If the bill passes, the Senate’s budget would dedicate $99 million in the next two years for a new ferry and state an intent to fund another $88 million in the following two years. “The only fix is to get more boats,” said Sen. Joe Nguyen, D-White Center, who sponsored the bill and whose district includes Vashon Island, during a hearing Wednesday. The bill would increase surcharges by 50 cents on all fares. Another 50 cents would be added to single-use fares but not multi-ride or monthly passes. Representatives from ferry advisory committees, which represent riders, testified in favor of the bill but warned against excessive fare hikes. Increases could “put service further out of reach of ordinary people,” said Walt Elliot, co-chair of a council of the advisory committees. Both budget proposals would also convert two existing ferries to hybrid diesel-electric vessels, with the help of money from the settlement on Volkswagen’s emissions cheating scandal. Lawmakers have likened a federal court order to remove culverts to the McCleary decision, which demanded the state fully fund K-12 education and dominated budget negotiations in Olympia for years. Culverts are structures that allow water to pass under roadways but can block fish migration. The House budget proposal would provide $214 million for culvert removal for the next two years; the Senate plan includes about $274 million for the next two years. Both chambers plan several billion dollars more in culvert-removal spending in the coming years, though how to pay for that will be the subject of future budget debates. The Washington State Department of Transportation said last year it would cost $3.7 billion to comply with the court ruling. “What we don’t have at this point as far as the House is concerned is a comprehensive plan about how we’re going to deal with culverts,” said Rep. Jake Fey, D-Tacoma, who chairs the House Transportation Committee, when he introduced his budget proposal. The two chambers should work together to come up with a culvert-removal plan, Fey said. Both budget proposals fund highway projects already planned as part of the Legislature’s 2015 transportation package, including work on Interstate 405, the North Spokane Corridor and the Puget Sound Gateway, which includes Highways 167 and 509. Both proposals also include about $8.5 million to restart planning for a new Interstate 5 bridge across the Columbia River between Washington and Oregon. The House proposal includes about $63 million for special-needs transportation like paratransit, $485,000 to give ORCA cards during summer vacation to students in the Highline, Tukwila and Lake Washington school districts who receive free or reduced-price lunches, and $250,000 to help people experiencing homelessness in King County access public transit. The Senate proposal includes about $53 million for special-needs transportation, $1 million to help businesses provide their employees with ORCA cards, and $1 million for grants to cities, nonprofits and businesses to implement “first/last mile” programs that help people get to transit. As recommended by a governor’s task force on orca recovery, both proposals would fund a study on reducing ferry vessel noise. Both also would fund studies of passenger-only ferries and of high-speed rail between British Columbia and Oregon. The House budget proposal includes studies on replacing the Ballard and Magnolia bridges and discounting tolls for drivers with low incomes. Before either budget plan was released, Sen. Steve Hobbs, D-Lake Stevens, proposed a 10-year, $15 billion transportation spending package that relied in part on a carbon fee. Voters in recent years have rejected two different carbon-fee proposals on the ballot. In response to Hobbs’ proposal, both business groups and environmental advocates raised objections. Neither transportation budget includes a carbon fee.